The parking office and information booth will be closed Friday 2/26 from 11am until 2pm for a departmental meeting. Thank you and we apologize for any inconvenience. 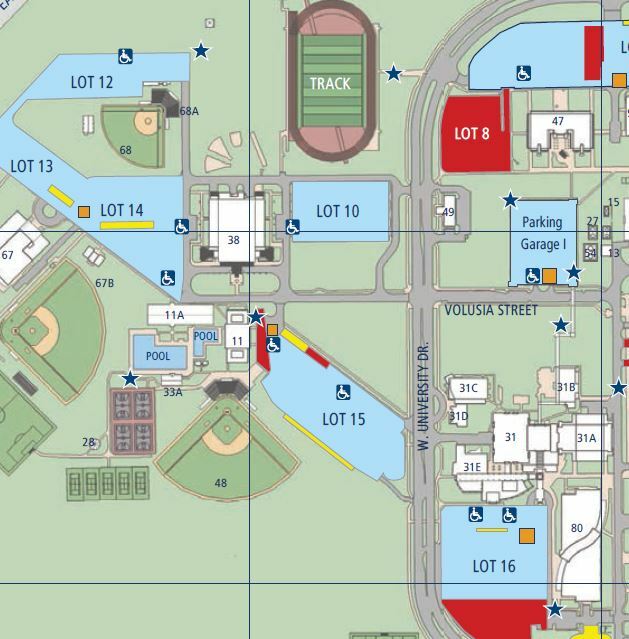 On Friday 2/26, Lot 27 will be shut down for the emb(race) 1 mile, 5k, & ½ marathon. All vehicles must be removed by 5pm to avoid towing. 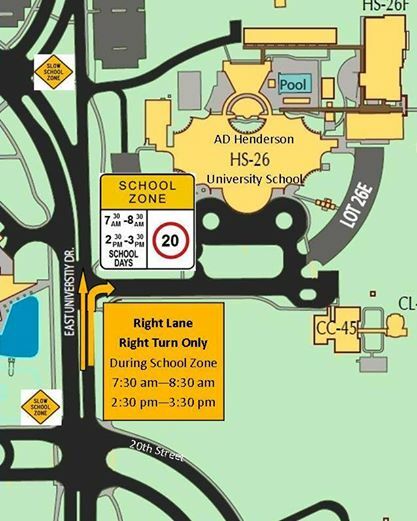 FYI: The right lane on University Drive (from 20th St) is a turn only lane into Henderson school from 7:30 am – 8:30 am & 2:30 pm – 3:30 pm. Starting September 28, a portion of Lot 15 will no longer be available for blue permit parking Monday through Friday 9am until 5pm. 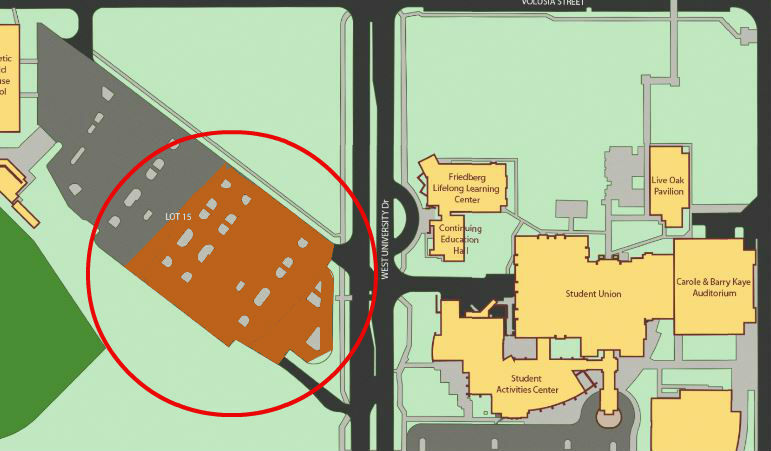 The east half of Lot 15 will be orange permit only and reserved for patrons of LLS, Lifelong Learning Society, to park during those hours. 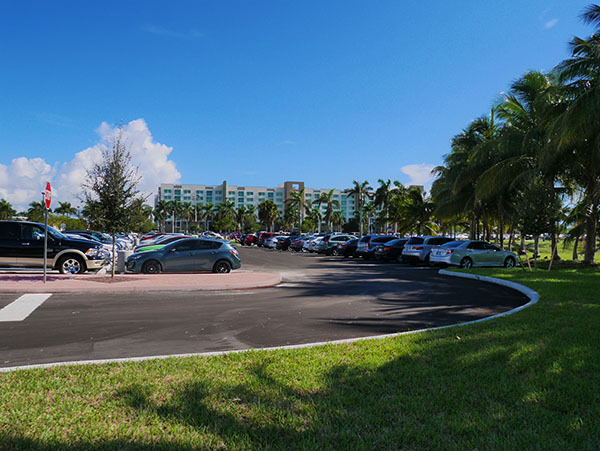 All other days and times, the lot be available for blue permit parking. We were working hard this summer renovating Lot 2 near the E Engineering Building Bldg. 96. Lot 2 reopened in time for the first day of Fall Classes. 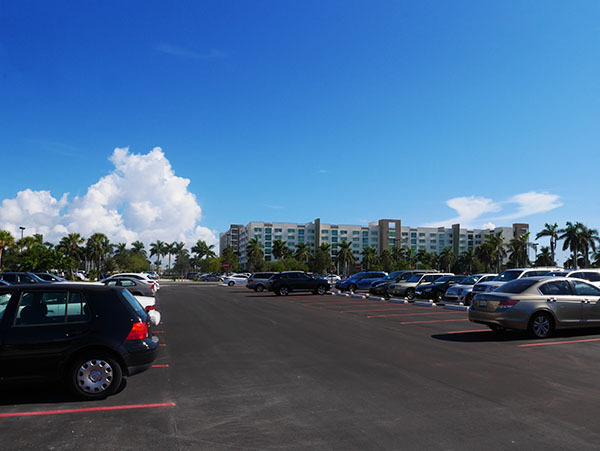 The lot was expanded to include 80 Blue Permit parking spots alongside its 220 Red Permit spots. Lot 2 now has great wide lanes to make it easier to pull in and out of parking spaces. Last but not least we added some much needed motorcycle parking in Lot 2. During the first few weeks of each semester we try to live tweet as the garages and lots fill. Throughout the year we also try to retweet any local traffic issues that might affect our Owls. Help! I Can’t Find a Parking Spot! I can’t find any parking spots! The Beginning of a New Semester! 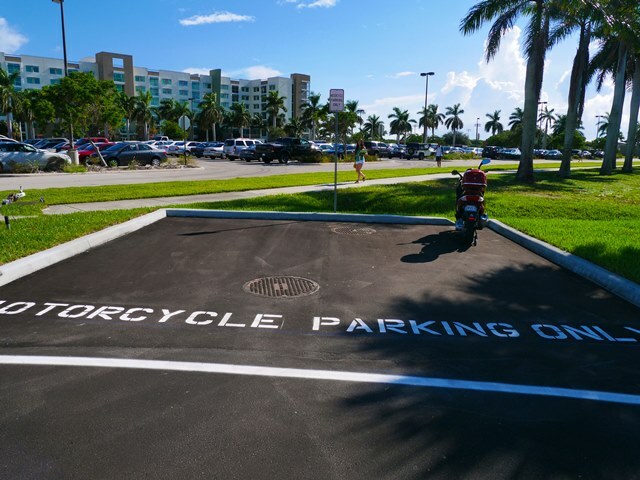 The beginning of a new semester or academic year brings with it the challenge of finding the perfect parking spot. Everything takes a little longer on campus during the first weeks of a new semester! Take comfort that after a few weeks the hectic search will stabilize as students and faculty get used to the schedules, routines and the locations that are available at different times during the day. 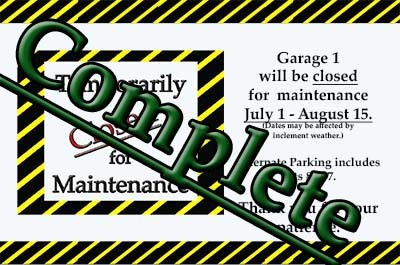 Watch for signs on the front of the garages and DO NOT PULL IN IF THE SIGN SAYS FULL. 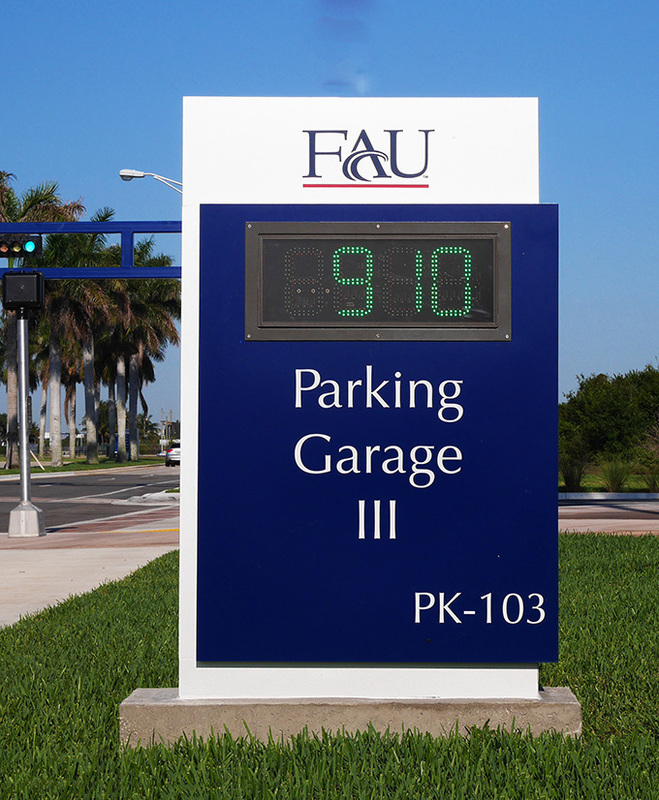 Garage 3 (by the stadium) has a digital counter that shows available spaces. Three (3) entrances to FAU from Glades Rd. 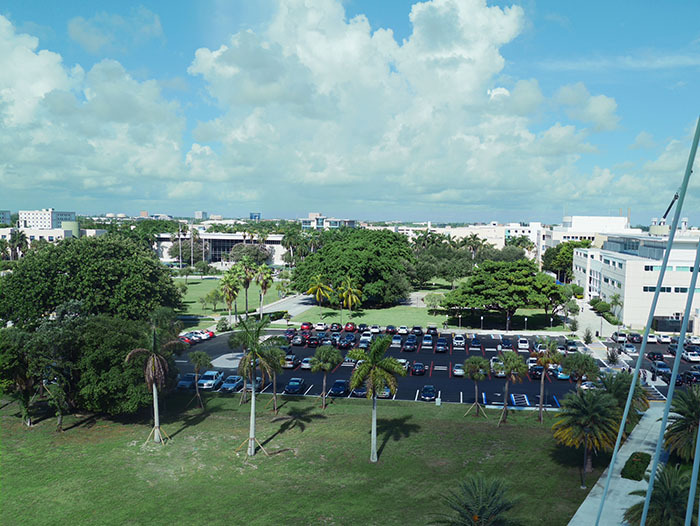 There are 5 entrances to FAU. Three (3) entrances off Glades Rd. The 20th Street entrance from Federal Hwy (between Glades and Spanish River). Surprisingly there really is plenty of parking spots on campus. However, they cannot all be right next to our classes, therefore everyone must allow extra time to walk or take a shuttle from the outer lots. 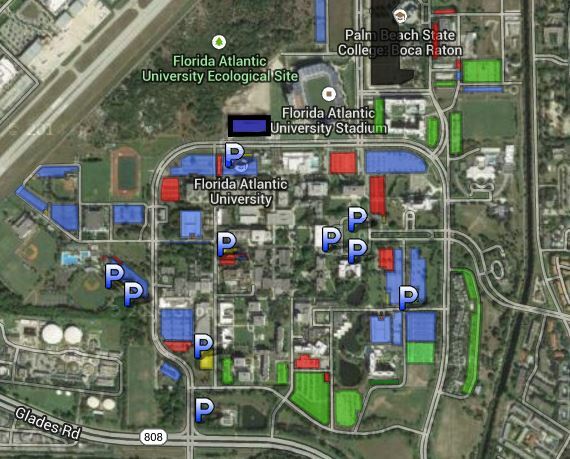 Adjusting your arrival time on campus may make a difference in the competition you face for a parking space. As with all large Universities, everyone wants to park in the central campus lots. Keep in mind that these lots (Lots 1, 4, 7, 16, 25, 28) usually fill first. If you are arriving after 8am it will be an exercise in futility to drive around trying to get one of these spots. Each semester is a little different, however historically Tuesdays and Thursdays are the busiest days. 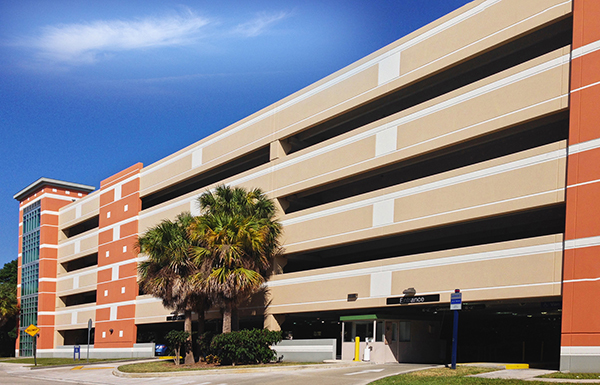 The parking garages 1 and 3 are usually full by 10:00 am and Garage 2 by 12:30 pm at the latest. So if you are arriving on campus later than this it is usually wise to head to the outer lots. (Lots 5, 12, & 13), as these lots are rarely ever filled. Familiarize yourself with the map, so you know where to find the outer lots when you need them. It takes far less time to walk from Lot 5, then it does to drive aimlessly around in traffic looking for a lucky spot. Make sure you know the Parking Rules. Make sure your permit is active and up to date. Click Here to find how to order your permit! Take a moment to read the rules and regulations. 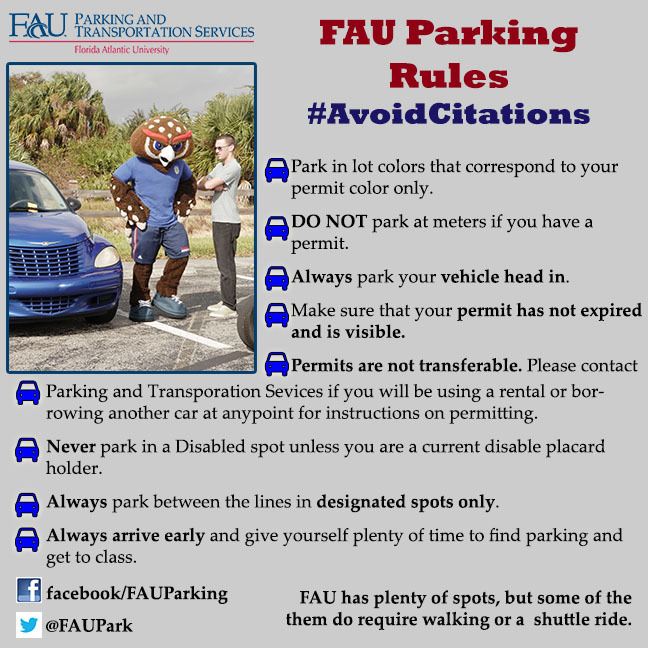 Following these simple parking rules can save you the frustration and costs associated with receiving parking citations. Let Parking & Transportation help if we can. 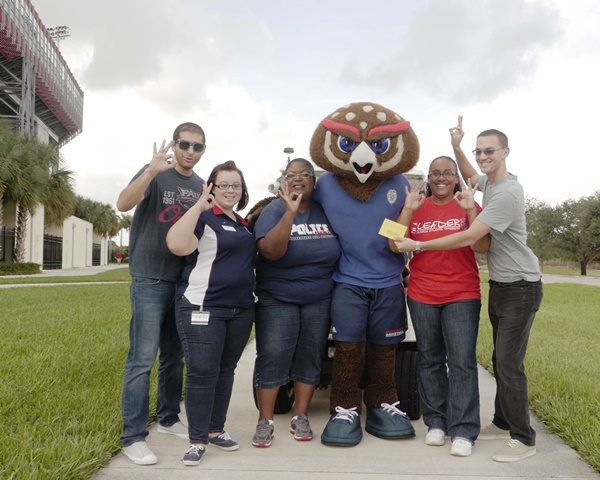 Our Customer Service staff is available via email faupark@fau.edu or by phone 561-297-2771 to answer questions and help solve problems. It’s Time to Order your Permits! 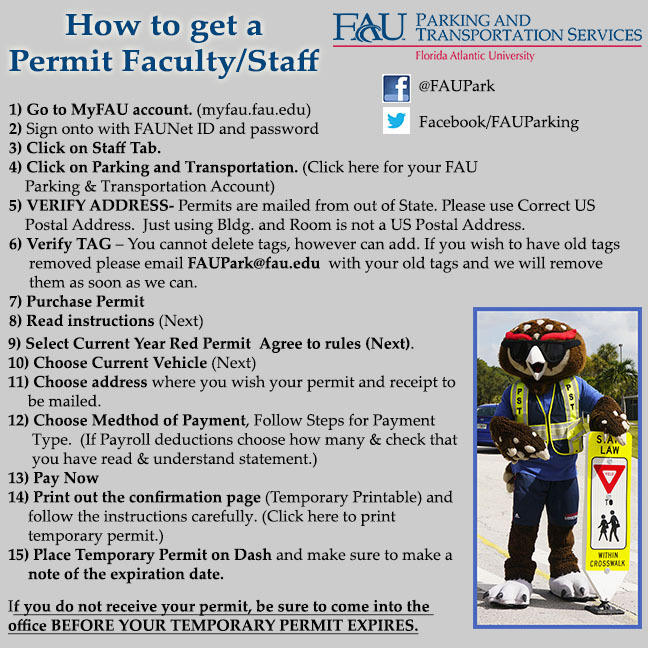 Permits are available online for students, staff & faculty. When you order online, make sure to print out your temporary permit and place it on your dash. The temporary permit does have an expiration date, so make note of it and if for any reason you do not receive your permit in the mail before the expiration date, pop into the office in the Student Services Bldg to get one. Use the cheat sheets below! 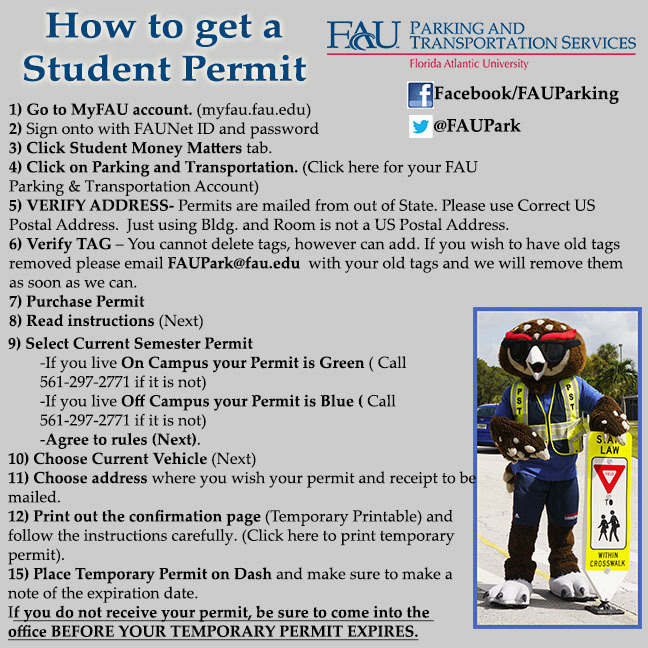 All registered students are eligible for a permit and anyone parking on campus is REQUIRED to have a permit. Citations for No Permit are $25.00, Don’t let this happen to you!!!! Need help Obtaining Your Permit? All permits are to be obtained online, however if anyone is in need of assistance or direction we can help. 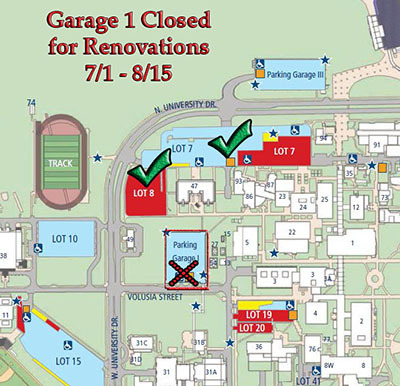 Parking will be open Saturday August 15th from 11am – 3pm. We will be fully staffed and have computers and printers to support anyone who needs clarity or direction. If you are an adjunct please give the office a call at 561-297-2771 to activate yours. Here are your cheat sheets on how to get your permit! Great News! 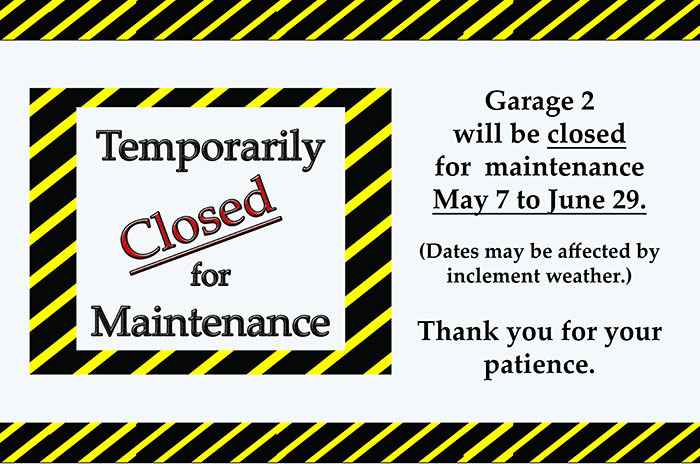 Garage 1 is opening ahead of schedule on Friday July 31st. Thank you for your patience this summer. 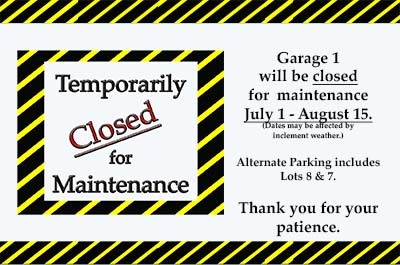 We apologize for any inconvenience summer maintenance may have caused, and we thank you for your patience as we continue to improve our University. 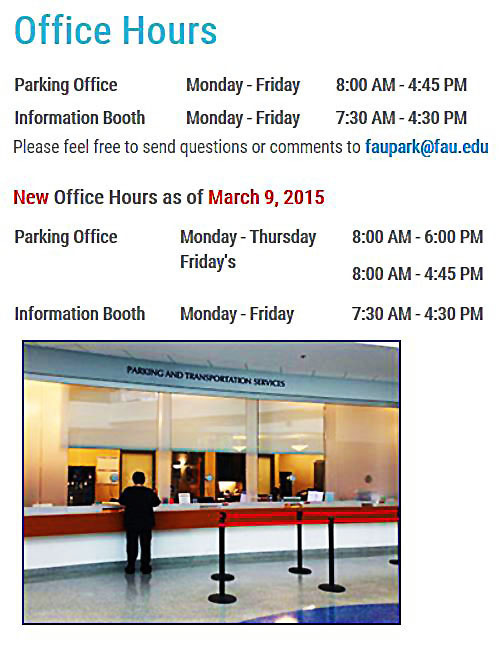 In order to better serve our students and staff the Parking Office Hours will change as of March 9th, 2015. Remember: 20 mph for school zones. 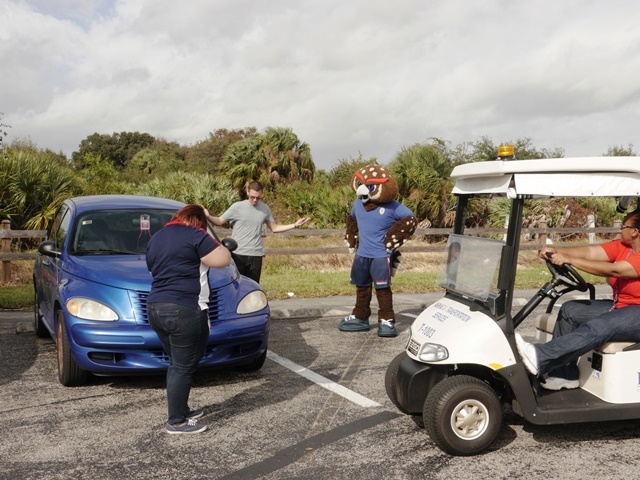 Take a moment and watch Owlsley demonstrate proper parking technique. 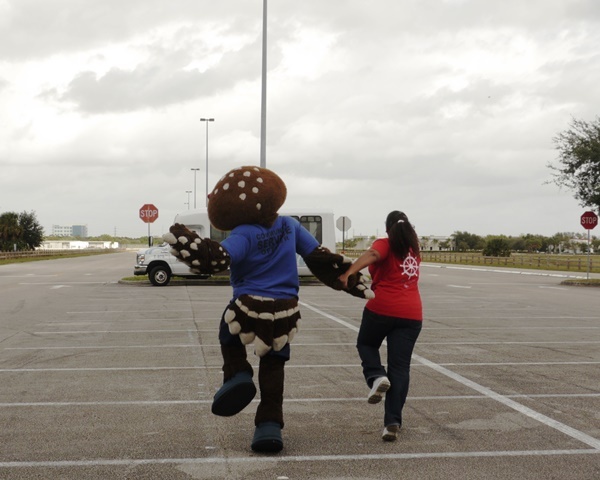 University Communications and our parking staff being such good actors! We had such a great time filming, we thought we would share some behind the scenes photos with everyone.